You have to check this out! 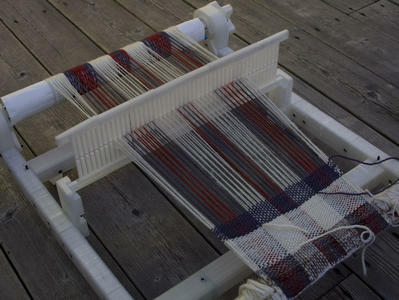 It's a FREE downloadable file for a rigid heddle loom that you can bring to someone who has a 3D printer. Now, I'm all about recycling so I suggest using scrap lumber to make the frame for the loom and have the 3D printer service make the shed block, ratchets, pawls and the heddle or just the heddle and purchase the ratches and pawls. If you're familiar with CAD software, you can probably make the heddle any width, height and dent you wish! Speaking of wishes, I wish 3D printers were as common as ink jet printers! Oh the fun we could have!